The crop nutrient balance--the comparison of nutrients applied to cropland in relation to those removed by crops--is an important indicator of the sustainability performance of crop production. Deficits in the nutrient balance can limit crop yields and deplete soil fertility, and surpluses can cause economic waste and increase the risk of harm to water and air. Plants require at least 14 elements as essential mineral nutrients. Each of the 14 is equally crucial to the plant's survival, but some are more likely to become deficient than others. Supplies of the three primary nutrients--nitrogen (N), phosphorus (P) and potassium (K)--need the closest attention to ensure adequate quantities for crop growth. The articles below chart the trends in the supply and removal of these three important nutrients in six major regions within Canada. The chemical nature of each nutrient, and the nutrient status of the soil influence the interpretation of nutrient balances. Nitrogen is considered a mobile nutrient, and is susceptible to several pathways of loss, including leaching as nitrate, denitrification as nitrogen gases, and volatilization as ammonia. However, soils hold reserves of nitrogen in organic matter. Phosphorus and potassium are considered immobile nutrients, held in the soil by sorption and precipitation reactions. Surpluses build up soil test levels for these two nutrients, while nutrient deficits can reduce their soil test levels. The balances presented below are estimates. Manure is estimated based on Statistics Canada inventory of cattle, hogs, and poultry and coefficients for excretion and recoverability. Fertilizer nutrient applications are calculated from industry data on shipments to agricultural markets. Legume fixation of nitrogen is assumed proportional to the nitrogen removed by the major legume crops, mainly forage legumes and soybeans. 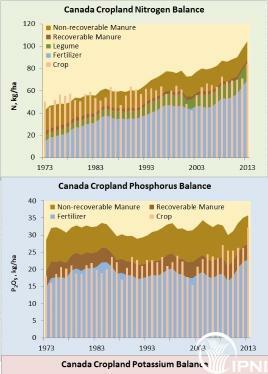 Crop removal of nutrients is estimated by applying coefficients to crop production data from Statistics Canada. In general, crop removals are increasing over time, owing to yield increases in the major crops. Nutrient balances have seen dramatic changes over the past seven years (2007-2013) in response to both weather and price changes for fertilizers and crops. Further detail on the assumptions and data sources is provided at the link on the left, and in a 2011 article in the Canadian Journal of Soil Science. Visit the links below for details on each nutrient in each region.